It’s hard to begrudge the particular ascendancy of Shannon Purser, even if you’re not a Stranger Things fan. Barb Holland, a marginal character with an unceremonious demise, became a cult favorite, and thanks to the internet’s inability to let things go, a young actress who does not fit the traditional physical mold of young actresses had a career for herself. Purser’s next couple of moves were on network television, but make no mistake, she is a Netflix Star, a relatively recently designation in Netflix’s still-new, extremely online star-making machine. Noah Centineo is a more recent Netflix Star, newly minted mere weeks ago with the release of To All The Boys I’ve Loved Before. It used to be that when a young star hit the Zeitgeist you had to wait about a year for the glut of their projects to hit theaters. But the algorithm must have taken into account Centineo’s height, the length of his eyelashes, and the frequency of his bashful laugh and known that by September 7, 2018, teens and teens at heart online would be hankering for more Centineo content. The pairing of Purser and Centineo in Sierra Burgess Is a Loser could go down as the Sleepless in Seattle of Netflix Originals, destined to pop up on more “Because you watched” suggestion lineups than perhaps any Netflix production before it. Purser plays Sierra, the titular loser, a smart, high-achieving high-schooler with one friend (RJ Cyler, twitchy and great in this year’s Power Rangers and twitchy and great here as well) and a massive complex about her looks. That complex is compounded by the everyday torments of Veronica (Kristine Froseth), the school’s resident mean girl. When Jamey (Centineo), the quarterback of the rival football team, hits on Veronica at a diner, disinterested, she gives him Sierra’s number instead of hers, and thus begins a rom-com contrivance that can’t possibly sustain itself through 100 minutes, but in fact, does. Soon Sierra works out a deal with Veronica to protract the ruse: Sierra will help Veronica not flunk her classes, Veronica will lend her face and physical presence to her burgeoning, 100 percent-built-on-lies relationship with Jamey. That this inevitably leads Veronica and Sierra to see eye to eye in a way is the most welcome surprise in the film. Sierra Burgess is an otherwise derivative teen comedy that aims to be Cyrano de Bergerac with smartphones and falls somewhere far more boring and creepy. (Was Cyrano the original catfisher?) 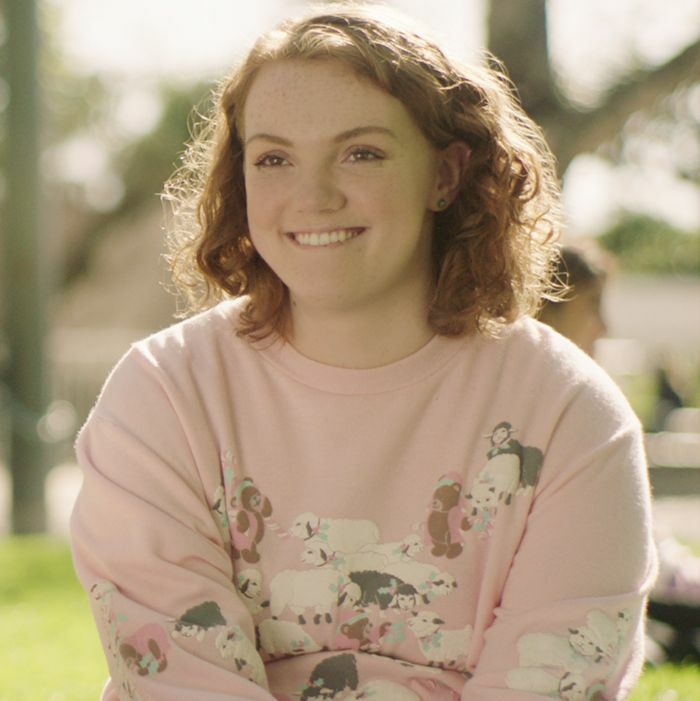 A big part of the reason for that is right there in the premise — a good amount of phone screen time is a necessity for any film about contemporary adolescence, but about half of Sierra Burgess’s plot unfolds on messaging apps, its romantic leads exchanging banal flirtations, reacting with furrowed brows to text bubbles that pop up on their iPhones. It feels as clinical as the soulless, ready-made “omg John Hughes vibes” synthpop soundtrack: several levels removed from an actual feeling or sensation. Worse, it casts a lot of doubt on the actual appeal of Purser — because in addition to being a Loser, Sierra Burgess is also a drip and a creep, and a late-stage lashing out against Veronica feels like a pretty bad offense to come back from for a last-act redemption. It’s the kind of screenplay event that gets toned down over a few drafts, but — from the script to the music to the unfinished-feeling sound edit — nothing about Sierra Burgess feels like it got past a first draft.